At SIC we operate through a strategically designed quality management system that is always evolving and adjusting to meet our objectives and service offering. 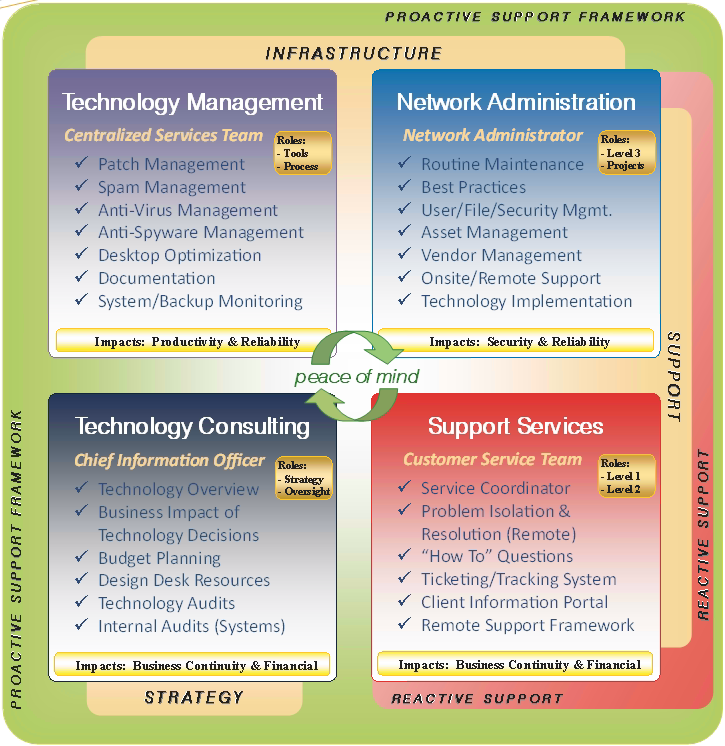 Our framework is based on 4 core service delivery areas. Our framework clearly defines our service offering and how we build up our individual roles within the organization. It defines and gives guidance to our unique approach that becomes “our company way”. Technology Consulting, Technology Management, Network Administration and Support Services – the “plumbing” of our infrastructure. The short answer is that everything is covered. The concept behind being an IT Department is that we handle anything in-and-around Technology. Now, that doesn’t mean we are always the only resource, or even best resource for every need. With many specialized products across many industries there may be a need to bring in someone from the outside who specializes in a specific product and/or service that can get the job done fast and cost-effectively. For example, there could be a specialized industry application based on platforms such as SAP, ORACLE where we, the IT Department, may handle daily routine maintenance, backup processes, user setups, configuration issues, or perhaps even upgrades. Often, however, there are contracts with such vendors that involve these other entities. These entities usually need to work in parallel with an in-house network administrator to get the job done. Another example may be a website that needs to be developed which requires complex programming. Yet another example is perhaps you are moving into a new location and a complete server room needs to be built requiring the services of a building contractor. The point being, is that every one of these situations require someone to be the advocate for the organization – someone who understands how everything ties together to maintain the organization’s strategic objectives. Research and pricing comparisons need to be made, project management and other preparations are all work we, as the IT department, handle as part of filling the realistic needs in every day business. Very often, just having someone there that knows the right questions to ask who understands “the big pictures” and knows what the final outcome should be, saves so much time and frustration. The areas described in the 4 core service delivery areas are all part of our routine service offering built around every day needs. These are all handled by our staff in a reliable, predictable and transparent manner. As we build partnerships with our clients, we define exactly what needs to be done on all basic levels as well as any special considerations. We offer 2 support options. The support options are based on a fixed-fee model which requires a monthly commitment that would allow us the ability to align our resources and processes in such a way that we would be able to deliver a specific and predictable end-result over time. We like to refer to our fee model as getting paid for keeping everything running, not hour-by-hour for “fixing things”. Basically, all areas of the “4 Squares” – the framework of our service offering – is included in the monthly fixed fee. The concept behind this fixed-fee model is that you shouldn’t have to worry about what is covered and what is not. We believe you shouldn’t be burdened with the day-to-day challenges of handling IT issues. We have found that a fixed-fee structure also provides a more natural alignment with our partnership model, simply because we have no “gain” when things go “bad” with technology challenges; meaning, we have the natural incentive to be proactive in keeping everything running smoothly and to as much as possible keep “reactive” situations under control, as any extra time invested on our part is of no benefit to us or our clients. In our experience, clients that have a “partial inclusive” service offering, are put in positions that ultimately work against them. They do not involve their IT provider in all areas that are related to IT in an attempt to avoid seemingly “additional” costs, however, they pay for it in the long run, and sometimes painfully. It is our belief that if the IT provider is left out of certain happenings or decisions being considered and/or made, then gaps develop and the IT provider is unable to give input or advice, which is part of a very necessary role to ensure a more predictable and desirable end-result. We believe that clients should not have to deal with IT issues, which most often they are not qualified to do anyway. They should have a trusted partner to go to for all IT-related matters. Many IT service providers are offering the more “reactive” type of service model where they exchange hours for dollars, and even though they may have the best of intentions, have no real motivation to cross all the t’s and dot all the i’s because essentially they get paid for their time, even if they end up fixing the same issues over and over in different ways. Individuals or companies offering this type of service almost always lack systems and processes that can be relied on, which often creates frustration and a chaotic working environment for all involved. Also, often the IT provider or business owner is still performing technical duties, which means he or she simply does not have enough hours in the day to focus on the “bigger picture” or the root-causes of issues, which is what is ultimately needed to minimize their clients’ risk and to be able to stay up-to-date with current technologies and solutions. Then there are many other IT service providers that on the surface are offering a more “proactive” type of service model. At first glance, this proactive model appears to look a lot like the one we are offering, and even sometimes at a lower price. However, what is not visible to many organizations is that there are core differences – and it is those differences that allow our company to deliver a truly proactive model with predictable results, when others simply cannot. When digging deeper into other companies (and even internal IT departments of some companies), you will often find a lack of focused leadership and an absence of critical systems and processes that make a truly proactive model possible. It is a fact that most IT service providers are increasingly gravitating to this service model called “managed services” due to the recurring revenue to their businesses. It isn’t that they are not well intentioned in wanting to provide a sound “managed services” or proactive model, because we believe they are, however, after building our business over 14+ years now, we have the experience of what is really involved to move from a reactive model of service with some proactive routines, to a truly proactive model. It takes so much more than effort and good intentions. It takes rebuilding an entire organization from the ground up with a completely different approach and solid systems and processes delivered by a fine-tuned team. We aim to educate prospective clients on the above differences amongst IT companies so that they can make a clear choice based on real-world circumstances of the IT industry. After many years of experience in providing IT services, we at SIC are clear on our intention to engage with prospective clients that are willing to form a partnership. These prospective clients are ones where we have successfully communicated our unique way of doing things, and from that mutual understanding, have established a “meeting of the minds” needed for a successful partnership. We believe that we cannot build this type of working relationship unless we offer an arrangement that can do nothing other than support the goals of both organizations. A true partnership simply cannot occur when one side profits at times from another’s pain – which unfortunately is often the case with reactive service models as well as proactive models that lack focused leadership and critical systems and processes, despite all good intentions on the part of the IT service provider.